Cycling gives you the option to spend amounts of money on your passion (that’s your bike, not your significant other?) that start to make your head spin. How about a bike for the price of a small car or feeding an expensive coffee addiction with the ultimate expresso machine? Ever since we were tiny, the thought of a bicycle under the Christmas tree has been exciting, so what would we like to see? Obviously Christmas is a chance to buy something new and better, which opens a whole debate about ‘which bike is best’. Our preference would be to stay local (in the UK) and go for either a Condor or a Qoroz, but you’re probably going to be pushed to get one built in time for Christmas, so you’re a little stuck with something off the peg, but that needn’t mean losing out on heritage and beauty, and doesn’t mean resorting to the mass-produced offerings from the likes of Trek. So for roadies we’d point you in the direction of your local Bianchi or Wilier dealer – and for off-roaders look at Orange and Whyte. However, how about going for something exclusive… it might take a while, but we found an ex-Team Sky bike for £4,495. Remember that it’s winter, so there could be a huge temptation to try something a little different that we can still take out for a ride in the ice and rain. A cyclocross bike with new-fangled disc brakes seems the sensible option, and would let us leave the carbon Bianchi in a nice warm garage, so a Cannondale CAADX 105 (at £999)would be a distinct possibility. But the real outside option, and the one that we’d love to see under the Christmas tree is a ‘fat bike’ – huge balloon tyres squeezed into a mountain bike frame, and designed to ride the wilds of Alaska, but equally good (for a huge laugh) on your local trails. Take a look at the Genesis Caribou (£1499), which ticks the local options. Cyclists love coffee, but why settle for a cafetiere or a stove-top expresso pot, when you can get a real coffe maker. Note – an Nespresso machine (or similar) is NOT a real coffee maker! What you really need is a Rocket Expresso machine – it wouldn’t look out of place in a darkened cafe in Rome and looks like it will outlive you bike (and probably you). Rapha can sell you a slightly pink branded version or take a look at Beanshot in the UK. You’ve got the bike and you need to get it to great rides, so you need a car… unless you’re a serious downhill addict, where a 4×4 pick-up is probably the de rigeur option, you only really have two options for Christmas – a Jaguar F-Type coupe or a Fiat 500 (preferably the Abarth version). You’re going to have to shop around for a roofrack for either of these, but with Sky’s legacy in the Jag and centuries of Italian heritage in the Fiat, you’ve got plenty to go at. Here at Mombee Towers we’re not about being overly brash with anything and, while the Jaguar F-type coupe come in a variety of options, the mid-range F-Type S with some added performance would, we feel, be the best option. Equally with the Fiat, the ‘base’ Fiat Abarth 500 with a few styling bits added would be perfect, but we’d be secretly hankering for the more powerful 595 version. No Christmas would be right without some clothes, but the obvious top-end options of Rapha and Assos have been blown-away by Paul Smith’s entry to the world of cycle apparel with his 531 range. It’s eye-wateringly expensive, but will be incredibly exclusive – whether you’d to risk getting a £550 jacket exposed to the elements and road grime is open for debate, but early impressions are that the kit will definitely be functional. Should you be completely stumped trying to find a present for the cyclist who has everything, don’t forget the most exclusive cycling t-shirts ever (? 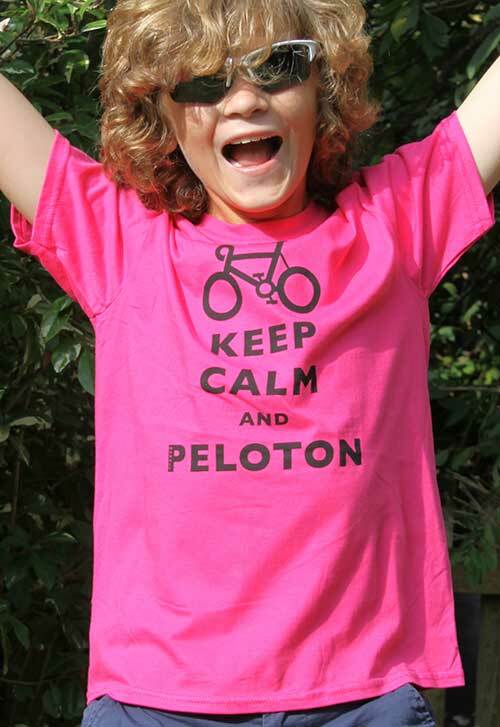 )… our Keep Calm And Peloton t-shirts… the perfect stocking filler for any hip and happening cyclist – available for men, women and children in a choice of brilliant colours.